22-year-old Air Force Airman First Class Robert Burroughs was shot in a Cedar Park apartment complex parking lot on Jan. 20. CEDAR PARK, Texas — Arrest affidavits have detailed what happened before and after the Jan. 20 shooting that killed an Air Force service member in Cedar Park. The suspects are believed to have been involved in a robbing spree the night he was killed. Just after 9 p.m. Jan. 20, Austin Burroughs and his wife had just parked at the Lakeline Villas Apartments when another man walked up and shot Burroughs as he got out of the car. First responders found him with a gunshot wound to the neck. The 22-year-old died in the parking lot. At a news conference Jan.28, Cedar Park officials said officers were able to get video of a white vehicle in the parking lot that was seen fleeing the apartment complex parking lot after the shooting. Cedar Park's police chief showed three mugshots for people who were picked up by the U.S. Marshals and charged with murder. Three people have been identified by Cedar Park police as suspects in the fatal shooting of an Air Force member. 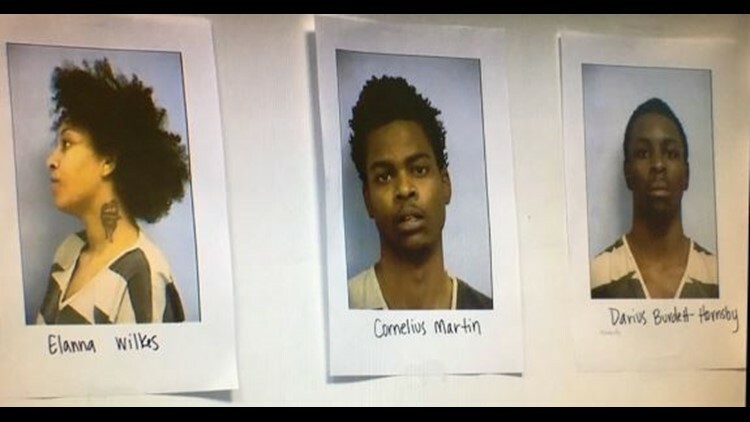 The three that have been arrested as the alleged suspects include Elanna Jena Wilkes, 19, Cornelius Martin, 18, and Darius Burdett-Hornsby, 19. The car that was seen fleeing the scene on the video belonged to Wilkes, an affidavit filed later said.On Jan. 24, Wilkes was pulled over by an officer and arrested on warrants, the affidavit said. During an interview with police, Wilkes allegedly said that she, Martin and Burdett-Hornsby got together the night of the shooting and decided to drive to two apartment complexes to rob people. She said they drove to Lakeline Villas Apartments when Burdett-Hornsby got out of the car to rob someone. Wilkes then heard a man say, "'No you got the wrong guy,' heard a gunshot and a female say, 'baby are you OK,'" the affidavit said. Wilkes said Burdett-Hornsby got back into the vehicle and apologized to Martin for what happened. She said they then drove back to Burdett-Hornsby's apartment. The day after Wilkes' arrest, Martin and Burdett-Hornsby were arrested. During an interview with Burdett-Hornsby, he allegedly told officers that when he was trying to open Burroughs' car door, Burroughs attempted to take the gun. That's when the gun "went off" and Burdett-Hornsby dropped the gun, he claimed. Burdett-Hornsby then said he picked up the gun and ran back to Wilkes' car. Burroughs' wife picked out Burdett-Hornsby from a photo line-up on Jan. 25 as the person who allegedly shot and killed Burroughs, the affidavit said. Cedar Park Police Chief Sean Mannix said the trio's sole purpose that night was to "go out and rob people at gunpoint." Mannix described the incident as "senseless and cowardly."